Well, I hope everyone had a wonderful Thanksgiving! Are you sick of the leftovers yet? Tell the fam that today you just want to order a pizza and be done with it! Shelbie and I made our annual midnight run to Garden Ridge (just because we can) and picked up a few Christmas essentials including wrapping paper (it's pink and I haven't showed it to Eric yet, so shhhhhhh!!) and the cutest glass Raggedy Ann ornament (I add a new one every year). Stamping time has been in short supply here lately (mainly because I am tired), but I did manage to get Jen's Sketch For You To Try done up here. I used the new set from Storage Units, Ink and More called Snow Day. 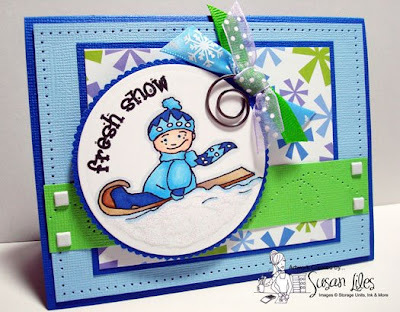 I just love this little sledding guy! He reminds me of Charlie Brown, so I hope he's not doomed to smack into a tree on the way down his hill--poor guy, if it weren't for bad luck, he wouldn't have any at all! Who feels like Charlie Brown today? Give yourself a hug for me! We hope to entice you to play along with us by taking you on a little blog tour today! Go check out Shannan, Carole, Amy R., and Amy S. and then create your own SFYTT (your favorite keyword) and post it to SCS so we can be so lucky to see what you've come up with! SUSIE Q-TIP: I have yet to acquire the Spellbinder's mat for dry embossing the edges of a nestability shape. I experimented and came up with a solution for in the meantime until I can get a mat: A plate, B plate, Nestability with shape still attached, 2 layers of fun foam (kid's craft foam), and 2-3 pieces of cardstock, B plate. It is not as embossed as I'd like it, but it will work for now. Fabulous card! Love the bright colours! Super cute, Sus! Hey...I have an extra mat...want it? That is super cute!! Bright and cheery!! The scrap cardstock WILL get cut w/ your image, I often fold up a scrap of regular paper into fourths or use an envelope of junk mail under there... I think it helps having the "fluff" behind the image rather than on top... HTH! This is so cute! I love the fun, bright colors! Sweet image too!